California Wildlife Day Launched in Carmel Valley! The inaugural California Wildlife Day (CWD) was joyously celebrated on March 24th with 450 guests in attendance at Garland Ranch Park in Carmel Valley. It was hosted by the Conservancy and the Monterey Peninsula Regional Park District (MPRPD), and featured a Native American blessing by Rumsien Linda Yamane, talks by CWD’s creator Beverly Eyre, Senator Bill Monning, Assemblyman Mark Stone, Supervisor Mary Adams, and MPRPD Bard Chair Kelly Sorenson about the importance of honoring and preserving our rich and diverse wildlife. 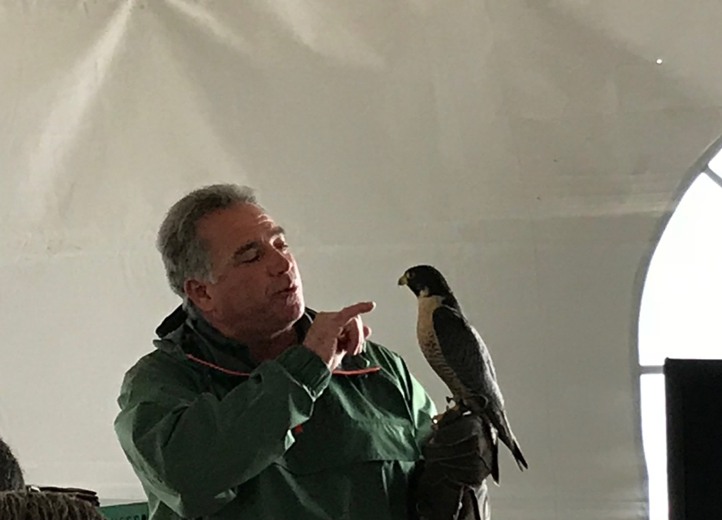 The program featured wildlife demonstrations including the fastest bird in nature—a peregrine falcon—which can travel at 300 mph, a great horned owl, bats, and a red-tailed hawk! Both kids and adults in the audience loved these demonstrations! Also in the program were children’s wildlife art creation, a flora and fauna walk, environmental exhibits by 20 organizations and agencies; student presentations and exhibitions of their poems, artwork, and wildlife projects; smoothies by the Bike Guy; observations of river invertebrates; lively music by a local band; and complimentary snacks, lunch, and libations for all! California Wildlife Day will be celebrated annually on or near the Spring Equinox in Carmel Valley.